'Beacon Towers', the Mrs. O.H.P. Belmont (Alva Smith Vanderbilt Belmont) estate designed by Hunt & Hunt c. 1917 in Sands Point. The estate was later owned by William Randolph Hearst. Click HERE and HERE for more on 'Beacon Towers'. The basement. 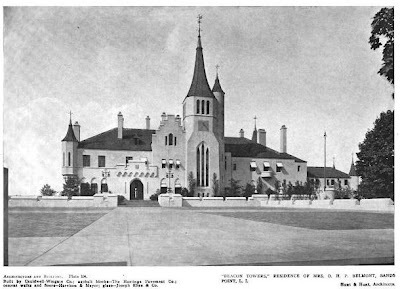 Exterior from Architectural Record, 1920. 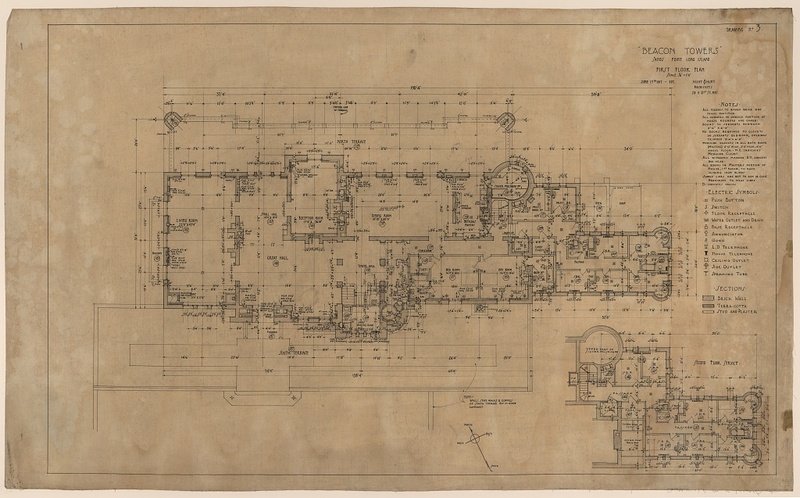 Drawing and Floor Plans from the Library of Congress. I want to thank Brian von R. for bringing the plans to my attention. Boy Zach, you're on a roll---the marvelous Wheatly narratives yesterday, and Beacon Towers floor plans today---what do you have in store for tomorrow? And where were these hiding on the Library of Congress site? What was that sound? Did Doug just faint with joy? And why wouldn't he? The elevator was ROUND! Great find! Always wanted to see these. I think the house is more visually appealing after Hearsts renovations. 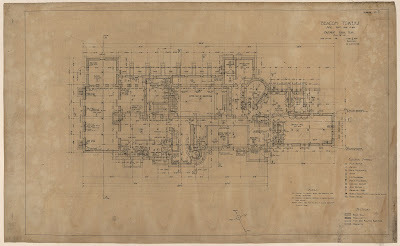 Does anyone know if the Hearst alterations retained the basic floor plan laid out by Hunt and Hunt? With the right night-time lighting, Beacon Towers could pass for Minas Morgul. All it needs is a steady stream of torch-bearing armed orcs and the The Lord of the Nazgûl flying above them. An all time Long Island favorite. Had to be simply breathtaking to see this place from the water, in the morning mist, at sunset, heck anytime you sailed past it. What a wonderful profile of towers, chimneys and turrets. A romantically beautiful place and amazing plans. Beacon Towers versus Idle Hour is a search for the lesser of two weevils. This place is cold, stupid and brutal. (Could it be that Paul Rudolph was conceived in one of the guest bedrooms?) It's frankly inapposite on the site, and I'll bet it was a miserable, dysfunctional place to live for its two owners. (Did either Alva from Alabama or Citizen Hearst spend much time there? I doubt it.) It has all the vulgarity of Biltmore with none of its redeeming values -- and there must be some, though they don't come readily to mind. If there are goals for a country house that we might all agree on, could this place possibly meet them? And which ones would those be? P.S. Bonus question: If this house were still standing today, which decorator/designer -- living or dead -- would you most like to see do it up? I think Alva just liked to build houses like most people sketch. I think any country house was built to escape the summer heat of the city. A wonderful waterfront masonry home with rooms to catch the breeze and large terraces to enjoy the views, accomplishes everything I could possibly want in a LI country home, plus the tower would give me a spectacular vantage point in all directions. I could also spot my place from miles in all directions, allowing a bit of envy and jealously brew in my neighbors minds as they too could spot my house from miles away. A wonderful house IMO. This place would look *great* on a cocktail napkin. The OLI houses I most admire were built by people who wanted to be part of a community of friends and family. Even the very largest ones were located in places near friends and relatives, and without exception, were well-integrated with the surrounding landscape -- extensive gardens, trees of all sorts, pools and ponds. Some of the builders may have been "house proud," or felt themselves in a not-so-subtle competition with their neighbors, but overall they built what they wanted for specific uses they firmly envisioned. Did either Alva or Hearst have family or friends in the community? (That's probably unfair, as neither had all that many friends anywhere.) Did Beacon Towers ever have any purpose at all other than as a half-thought through design statement and a show of great wealth? Did anyone ever enjoy being there? Perhaps if Alva had built this monstrosity in Mobile, Alabama I would object to it less. It would have made more sense as a monument to Southern Folly. Dear, dear Ancient, always holding back. Don't be so shy, tell us how you really feel. Much of what you say is inarguable. But I still think the tower, while in no way great architecture, is nevertheless just sorta wonderfully dream like---a Joseph Urban stage set if you will. I can see the melting witch scene from Wizard of Oz staged there, no problem. To be on the seaside terrace was no doubt dramatic. 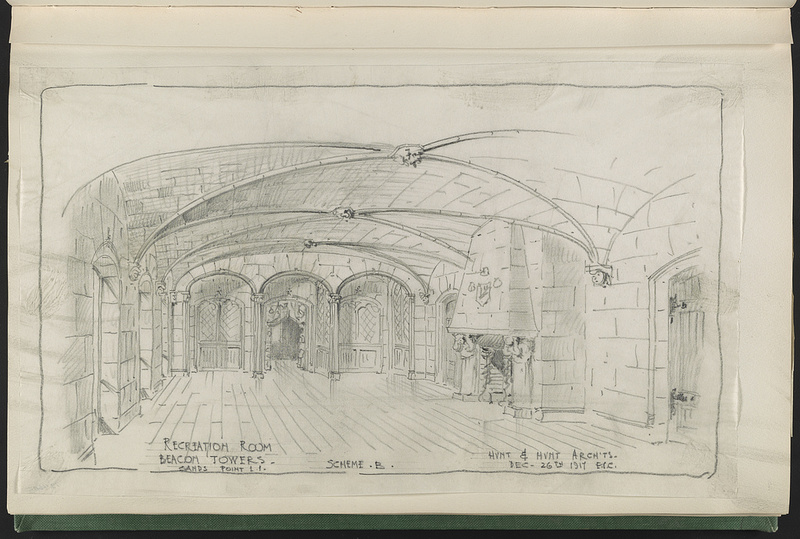 To be inside was no doubt like being in a catacomb at best-- The vaulted basement rec room gives me the creeps. Goals for a country house? Fresh air, a relation to site, ample recreation, logical plan, privacy, invisible services, proportion, proportion, proportion. Designer to do up Beacon Towers? Who does those Medieval Times restaurant interiors? Guest quarters for visiting friends. These quarters should be ideally be sited away from the main house. The next town would be ideal. To me, the original composition of this house is quite exotic but doesn't really work, except to emphasize the tower - and I like the tower, a lot. Hearst's redo brought the remainder of the house's aesthetic and scale equal to the tower, but it lost the exotic dynamic of the original. I am torn as to which one I like better. I'm grateful for the floor plans. The layout of the rooms is much simpler and liveable than I imagined. 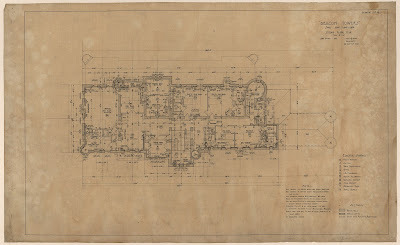 I think this is the first plan I have seen with palatially sized master bathrooms - the likes that would not be seen again until our modern day McMansions. It is the back that has always bothered me most. Although Beacon Towers rises dramatically above the waters edge, I want to step off the back terrace of my country estate onto a lush lawn with fragrant plantings and the sound of children running and playing and the description of activities we read yesterday from Morgan, not fall fifty feet to my death on the rocks below. Despite criticism, Beacon Towers would be a pleasure to experience in person, if only we could. • Was this a beautiful house – no, not really, not even after the Hearst renovations, which helped it a lot. • Was this house so surreal, & unusual & unexpected on an American beach that you couldn’t stop looking at it – oh, hell yes. • As with the recreation room I suspect most of the interiors were over-the-top & I suspect Hearst left them that way. But that was Alva; notice her bedroom is huge (I’ve also always thought the interiors of ‘Marble House’ were oppressive due to their opulence crammed into relatively small spaces). • The floor plans are good, functional; but it’s a good thing this house sat on an elevation overlooking the beach because the interior lines of sight are not that interesting. • A round elevator! That is totally impressive (I’m too old to say ‘cool’). I remember when ‘Lands End’ came down Mansions commented on how that could have been a trophy house, unmistakable from the water. ‘Beacon Towers’ could have remained a trophy too. Mansions speculated then that ‘Beacon Towers’ might be uninhabitable in today’s lifestyle but after seeing the floor plans I’m not so sure … move the kitchen to first floor, replacing the servant’s room … etc. etc. etc. "I really hate this place." My eyes hurt in an LDS Temple at Salt Lake way. Even an imagined Olmsted overlay couldn't improve things enough for these eyes. 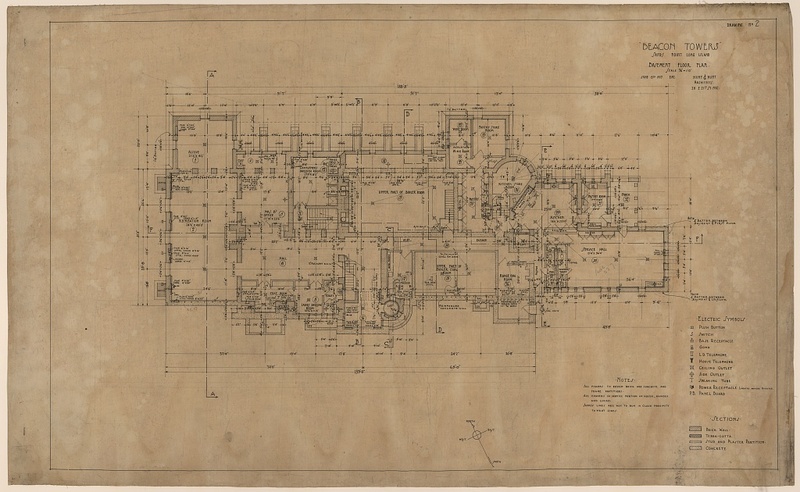 But the floor plans are gorgeous! I am going to presume that Ancient is not a devoted fan of either Alva or William as people, just a hunch, yet architecturally speaking, his commissions with Julia Morgan, especially his fairytale tudor home Wyntoon in California and Alva'a collaboration with her numerous architects, created incredible architectural design legacies, IMO. Fantasy and whimsy and a touch of ostentatious fun. I can't confirm if anyone enjoyed being here, but I would be first on the list to stay there forever if presented the keys. Glen you are brilliant today. I noticed the enormous master baths also. The second floor master bedrooms and baths are indeed right in scale with todays ginormous homes, yet the floor plans remain quite liveable. I do think this unique site, close to the pinnacle of a hilly peninsula cried out for a bold house that doenst fit into the landscape. I want to see something dramatic every once in awhile. It is all fantasy and showmanship with a touch of romantic fortress and every so often one needs a playful house that breaks all the rules. Beacon Towers did that ten fold, thank you Alva. Here proportion can be discarded in favor of drama. I would give up the vast expanse of formal gardens (which I love) and the rolling lawns for a dramatic waterfront perch anyday. It is however good to see the variety of opinions. Put me in the "loves it" camp, just for the shear fantasy and grandeur of the place. Thanks for the plans, Zach. I don't object to eccentric design. I liked the Monastery in Huntington very much, for example. I object to ugliness. Sometimes I like huge houses that others don't -- Red Maples, for example, though in that case it's because I may know more about what the insides originally looked like than any one else left alive. But usually I'll prefer something smaller -- more human-scale. Wawapek as it once was, say, stuffed with art and one-of-a-kind Tiffany pieces on three hundred acres designed by Olmstead. Even Wheatly, for all its grandeur, had a basic human scale to it. I suppose I'm trying to say I don't like the things put up by people who wanted to pretend they were The Duke of Westminster. Once you forget you're an American, any number of troubles ensue. You forget about New England architecture. You forget about Tidewater architecture. You forget where you are. DED - And where were these hiding on the Library of Congress site? At that time they were transferring the material to the Library Of Congress. I was told(probably about this time frame) material will put online. I would suspect as time goes on more will become available. Besides the floor plans were a number of other plates. PLUS all their other designs should go up as well. These plans weren't online until a short time ago. My thinking is additions will be added over time. Unique, if nothing else --- somewhat of a cross between Disney-esque and modernist fantasy. 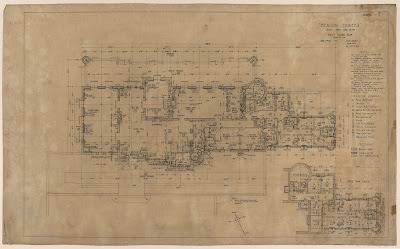 But the floor plan borders on brilliant, the whole, whether you love or hate it is unforgettable, and its presence on the shore would have been undeniable. Many assume the Magic Kingdom castle of the 1950's Disneyland was based upon Mad King Ludwig's Neuschwanstein Castle but its far more logical that Hearst who was friends with Disney (and put Mickey Mouse into his newspapers as a comic strip) gave him a tour of the LI manse. It doesn't change the fact that in our modern eyes Beacon Towers seems far less regal and much more cartoonish. Variety is however spice of life. i don't know if this has been mentioned or not, but WR Hearst never lived in "Beacon Towers". he bought it for his wife, once she stopped visiting San Simeon. sh'es the one who instigated the remodeling... to "open it up a bit". she renamed it, too. from "Beacon Towers" to "Chateau St.Joan". and re: the plans. actually, i found them through the "Beacon Towers" entry/page on wikipedia...they're listed as a reference! so i followed that link & lo-&-behold, there they were! 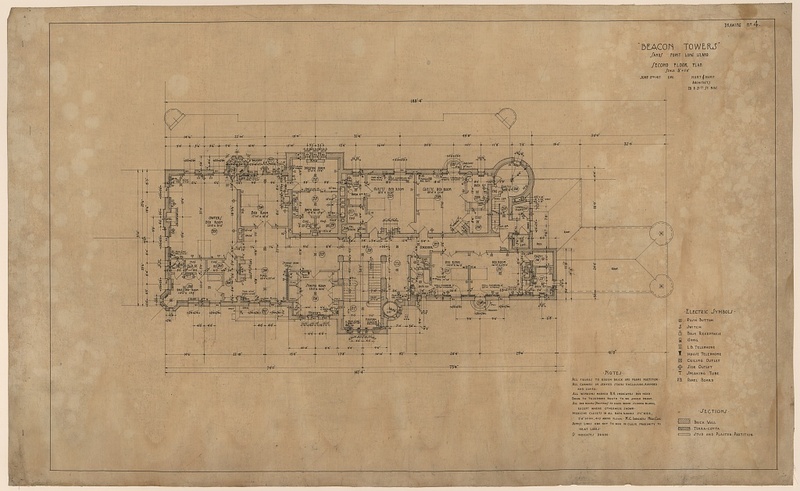 and while these plans were my "Holy Grail", my favorite Hunt & Hunt Long Island country house is definitely "Hempstead House", which a friend sent me the plans for, a while back. not quite as picturesque as "Beacon Towers", but much more liveable, i think. Ancient, thank you for the interesting links. Your comment about forgetting you’re an American is interesting & it reminds me that Alva Smith Vanderbilt Belmont saw to it her only daughter became the Duchess of Marlboro & that Alva lived the last years of her life in France, as did Willie K. for the most part; as did many other American heirs & heiresses of that era. I remember reading somewhere that 110 years ago judgment was made by some as to which American expatriates circulating in European society allowed their American background to show & who suppressed it. I guess it did indeed cause issues at home here, too. After the Civil War, the brother of one of my ancestors decided he'd had it with America. He took his share of his father's fortune and left for Europe. He acquired one of the great palazzos in Venice and restored it. He returned the gardens to their former splendor. While he always maintained a house in New York, his children were raised as "Europeans," and taught to turn their backs on Philistine America. They had lovely lives themselves, but their own children seem to have all disappeared in the chaos of the Second World War. Ancient- I wouldn't be surprised if they were here in America.